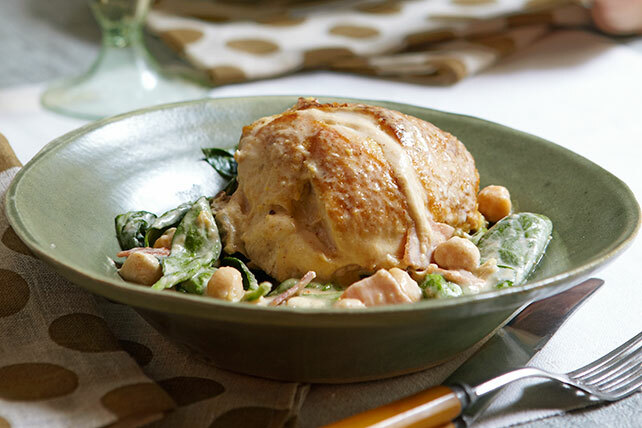 Bone-in chicken breasts are super-flavorful in a creamy sauce with chickpeas and wilted baby spinach. See how to make them in this quick how-to video. Blend broth, cream cheese, pepper and 1/2 cup chickpeas in blender until smooth. Heat dressing in large skillet on medium heat. Add chicken; cook 8 min. or until browned on all sides, turning occasionally. Add ham and remaining chickpeas. Pour cream cheese sauce over ingredients in skillet; cover with lid. Simmer on medium-low 15 min. or until chicken is done (165ºF). Add spinach; cook, covered, 5 min. or until spinach is wilted. Substitute PHILADELPHIA Neufchatel Cheese for the cream cheese. Substitute 1 broiler-fryer chicken, cut into 8 pieces, for the chicken breasts.